The “noodle revelation” known as Qin is now open on Capitol Hill. Here are some things to know before you go. Food critic Bill Addison’s job is to crisscross the entire country, eating and eating and eating, then writing about what’s best for Eater.com. (Tough work, but …) Last year, he called the biang biang noodles at Miah’s Kitchen his “Most Profound Noodle Revelation,” saying they “made more of an impression than any other dish in a whole week of memorable eating” in and around Seattle. Miah’s Kitchen is in Redmond, and its first sibling, Qin, is in Edmonds. Now a Qin has quietly opened in Seattle, too. With mismatched chairs and a lot of the laminated menu casually crossed out, it’s a welcome newcomer on increasingly upscale Capitol Hill. (In the beginning, in October, the chalkboard inside still said part of “Baguette Box,” the former occupant of the space.) What’s important here isn’t the design, or the décor, or even the name — there’s still no sign outside right now. It’s the house-made noodles, and some of them aren’t even on the menu. The hand-shaved noodles: These are listed on a hand-lettered sign taped to the window touting their “new chef special,” which I missed the first time around. Don’t make my mistake. About half-an-inch wide, of irregular thickness and cut into manageable lengths, these noodles are super-chewy but yielding, doughy in a good way, fresh-tasting and delicious. They come in a bowl of steaming-hot beef broth, rich and fragrant with a spicy pool of chili oil — on one visit, more like a chili-oil spill — on top. Some of the beef slices may be less than tender, but no matter. This soup, with these noodles, is what winter wants. 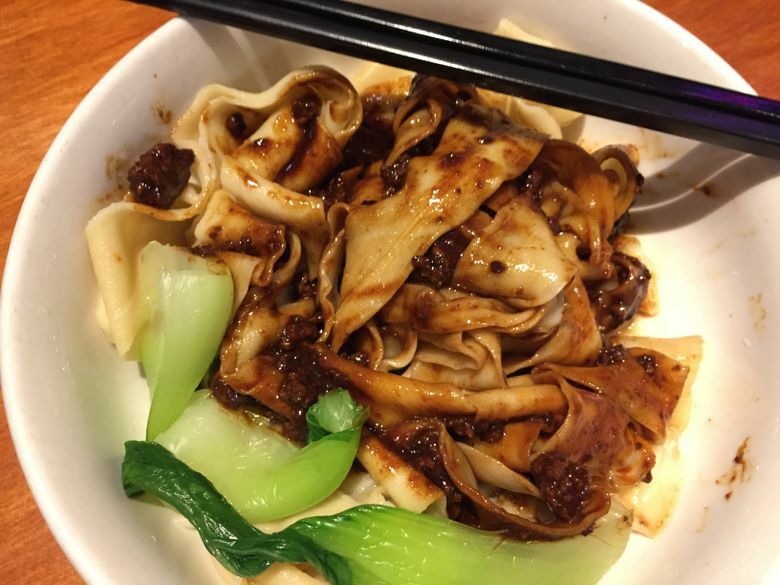 The hand-pulled noodles: Thin-gauge and possessed of an admirable firmness, these noodles are so long — and so good — that trying to share is just going to cause problems. They come in the same beef-soup format, from the same taped-up sign, as the hand-shaved noodles above, but don’t overlook the cold version, served with julienned cucumber, bits of squidgy textured vegetable protein, refreshing vinegar sauce and tingly spice that makes it a dish for all seasons. These are kinda-sorta listed on the printed menu: You want “Cold Noodles,” which are the hand-pulled ones, not “ ‘Cold Rice’ Noodles” (probably also good, but not made here). The biang biang noodles: The prized noodles of China’s Northern Shaanxi province, these wide lovelies are named after the banging sound of making them as they’re stretched and slapped out. They’re substantial but supple, bouncy to the bite. Qin’s are, like its hand-pulled ones, extra-long for even more fun. I tried the hot-oil seared version, a good, uncomplicated showcase; the spicy cumin beef, which didn’t have a lot of cumin and did have tough pieces of beef; and one with pork sauce, which made a rich, salty-tasty coating of gravy. Are the biang biang noodles here better than the really, really good (and cheaper) ones at Xi’an Noodles on the Ave? It is up to each of us to find out. The other stuff: Lamb dumplings were heavy and dull, while a spicy cumin beef sandwich had a flat roll that was so hard, it tried to defy a serrated knife and did defy eating. 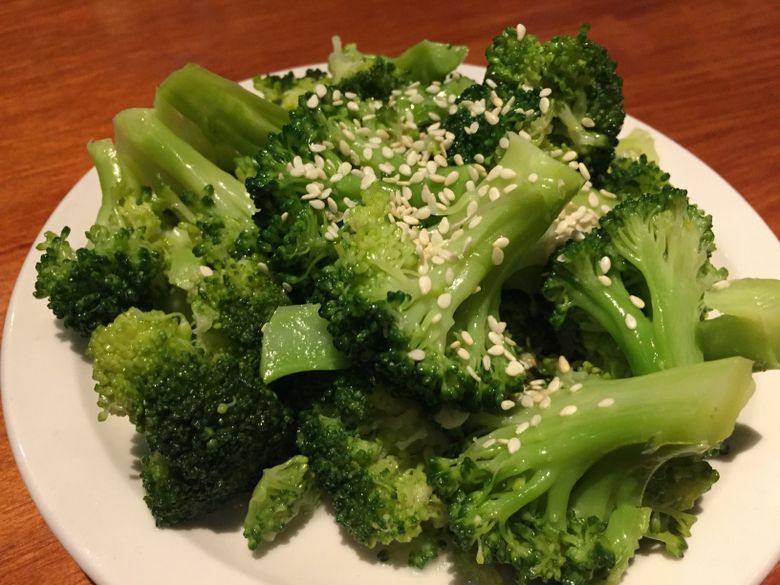 It sounds counterintuitive, but try the broccoli — served cold, still bright-green-fresh and extra-garlicky, with sesame seeds — instead. A huge platter of chicken with tons of whole chile peppers, suitable for three or four people, recently handwritten onto the menu in English as “Big Plate Chicken,” also looks great. But I’m having trouble getting away from the noodles. 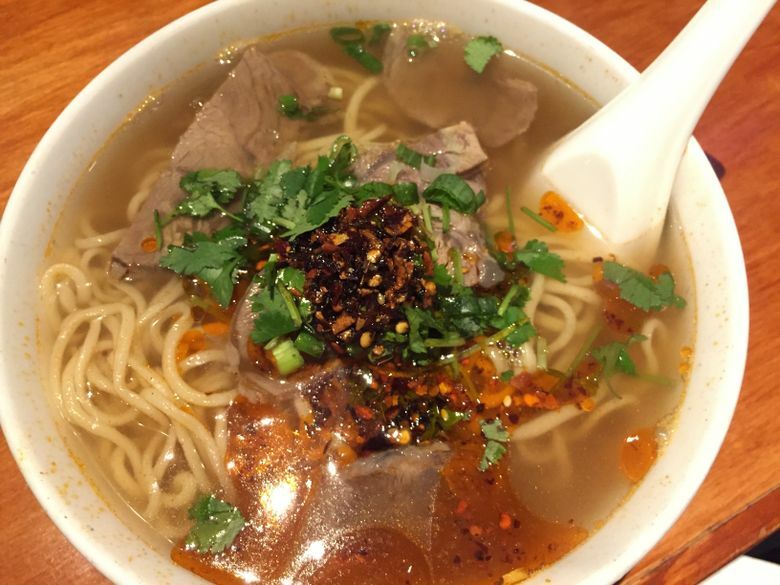 Prices: Hand-shaved noodle in beef soup, $12.99; hand-pulled noodle in beef soup, $12.99; cold (hand-pulled) noodles, $8.99; biang biang noodles, $8.49-$9.49; lamb dumplings, $6.49; spicy cumin beef sandwich, $5.99; broccoli with garlic sauce, $4.49 (all before tax and tip).